Panic When A Warning Lights Shows Up? Panic When the Engine Light Turns On? There is much confusion about the warning lights on your cars dash and what they mean. Here is a guide to four common lights, and what they mean. Battery light – if you see this light you may not need a battery, but you shouldn’t ignore it. This light monitors charging system voltage and the electrical system. If it comes on and stays on, it means that your battery is not being charged, and sooner or later your car will not start. ABS light – this is the Anti-Lock Brake system. When it comes on, it means the anti-lock part of the brake system has a problem and likely will not function. ABS was designed to help the car stop straight in panic situations. If just this light comes on, you will still have regular brakes. If it comes on along with the “red brake” light, the car has problems and you should not drive it. Engine Temperature light – This is like a thermometer for your engine. If it comes on, it is too hot. Turn it off and call for help, if the car must be driven, wait for it to cool off and only take short trips. Continued operation will cost a lot more money as it can ruin the engine. Tire Pressure light – This indicates that the computer sees a tire that has low pressure. Sometimes the tire won’t actually look low. That’s because the system can be very sensitive. It could also mean the sensor itself is bad. Check y our tire pressure and correct it as soon as you can. The bottom line is that these lights are your car’s way of communicating with you – so never ignore them! When in doubt, take your car to a mechanistic you trust and discuss your cars needs. Many of us at one time or another have had the check engine light come on. This can be a common occurrence with many vehicles and is not always a serious problem. Having said that you never want to ignore the light as it is part of a built in computerized diagnostic system. 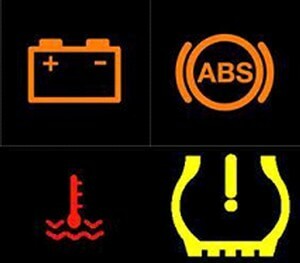 You should not confuse the check engine light with the service light or the maintenance light as these lights have a different meaning then the check engine light. These lights refer to a regular requirement like a tune up. They will light up at a given mileage to let you know that a service is required. To have a better understanding why the check engine light may come on it is important to know what year your vehicle was made. If you have a car or truck built before 1996 and your check engine light comes on, it could mean that there is a failure somewhere in the car/trucks electronic engine control system. If the solenoids, actuators, or electronic sensors are not working properly you are going to see the light come on. As of 1996 all cars and trucks are required to have more strict exhaust emissions guidelines. Not only will the check engine light monitor the electronic sensors, actuators and solenoids but the vehicles emissions as well. This is the emissions control system. Now the check engine light will monitor several emissions factors such as the exhaust that comes out of the engine. Cars and trucks built in 1996 and newer have very strict guidelines that monitor the catalytic converter as the exhaust exits this system. These new systems are so intense that the check engine light may come on if you don’t fasten the gas cap properly.